Last November Google officially outed its redesigned (and Material Design-infused) Calendar app for Android, and today it’s bringing the same design and features to iOS. The search giant has released Google Calendar for iPhone, and it’s already up for grabs in the iTunes App Store. Believe it or not, this is the first ever official Google Calendar app for iOS. So far to get Google’s calendar on Apple’s mobile platform you were able to use the system built into the OS, or countless third party apps. From now on you’ll also have this official alternative. 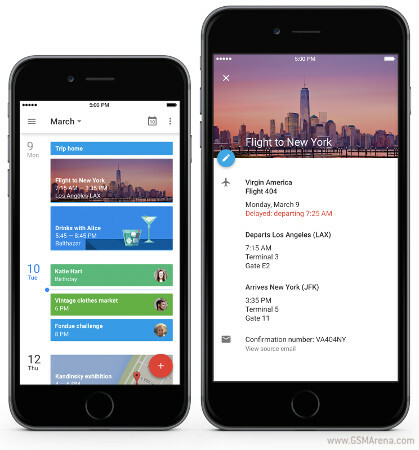 The Google Calendar app works with iPhone, iPad, and iPod touch, but it’s optimized for the iPhone 5, iPhone 6, and iPhone 6 Plus. It requires iOS 7.0 or later. It supports all the calendars in your phone, including Exchange and iCloud. It comes with multiple calendar views (from one single day to an overview of many days). Schedule view lets you see your schedule at a glance, complete with photos and maps of the places you’re going to. Events from Gmail, such as flight, hotel, concert, and restaurant reservations, all show up automatically in the Calendar app. Assists are smart suggestions that help you when you create new events, and they work for event titles, places, and people.